As one of the most developed metropolises in China, Shanghai is comparatively easy to explore on your own, so we do not arrange any guided service in this city. Upon arrival, please find your own transportation to the hotel we have booked for you. There are several ways to get from the airport to your hotel. If your flight lands in the Pudong Airport (PVG), you can take subway Line 2 and get off at Guanglan Road, go to the opposite to continue your trip to People's Square Station, then change to subway Line 1 (Fujin Rd. Direction) and get off at Hanzhong Road after 2 stops. From the exit, walk about 5 minutes to your hotel. The Maglev train also runs between Pudong airport and Longyang Rd. Metro Station. The standard class ticket for a single trip is CNY50 per person and it only takes 8 minutes. From Longyang Road you will need to take a taxi to your hotel that will cost around CNY50 - CNY60 per cab. If your flight lands at the Hongqiao airport, the subway is the most economical choice. Take Subway Line 10 to South Shaanxi Rd. Stop and change to Line 12 to Hanzhong Rd. Station. From the station you can easily find the hotel. Of course you may prefer to take a taxi especially if you have a lot of luggage. It should cost CNY180 per cab from Pudong airport and CNY60 per cab from Hongqiao airport to your hotel. After breakfast in your hotel, you can start your sightseeing. Here is our suggested itinerary for you that includes the Shanghai Urban Planning Exhibition Center, Yuyuan Garden and the Bund. We suggest you go first to the Urban Planning Exhibition Center. As a new tourist site, the center is a good introduction to the city. You can rent a personal Audio Guide for CNY20 or hire a professional English Speaking Guide for CNY200. Allow about one hour for your visit. To get there, you can go to Hanzhong Road Station to take subway Line 1 for 2 stops and get off at People's Square. Come out from Exit 2 or 3 and then you will see the museum. After that, take subway Line 8 (Shendu Highway Direction) for two stops to Laoximen Station, change to Line 10 (Xin Jiang Wan Cheng Direction) for one stop to Yuyuan Station and exit at Exit 1 to Cheng Huang Miao (City God Temple) area. Yuyuan Garden is located in the center of Cheng Huang Miao area. There are many restaurants, snack shops and cafes where you can purchase lunch. After lunch, you can go to the “postcard” of Shanghai - the Bund. Return to Yuyuan Station to take subway Line 10 to East Nanjing Rd. Station. 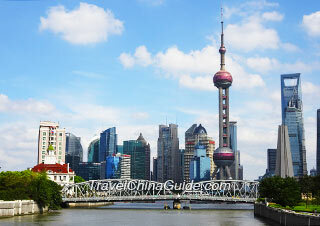 Leave through Exit 1 and walk east along the pedestrian street for about 15 minutes, you will reach the Bund. We highly recommend the one-hour Huangpu River night cruise that costs CNY100 per person. If you are tired after so much walking, we suggest you consider taking a taxi back to your hotel (CNY25 per cab). Your train ticket from Yichang to Shanghai will be delivered to your hotel today, so please remember to pick it up. Today you will take a bullet train from Shanghai to Yichang on your own. Walk to the Subway Station at Hanzhong Road and take subway Line 1 (Fujinlu Direction) for one stop, get off at Shanghai Railway station. Normally the train departs from Shanghai Railway Station at 09:30, however, please do double check the departure time when you get the ticket. In order to get to the railway station at least one hour before the train departure, you should leave the hotel before 08:00. So you should get up earlier and have a big breakfast. You are also suggested to buy some food and bottled water the day before at a super market nearby to take on your 7-hour train journey. Although there is a dining car available on the train, the food is simple and the quality is poor compared with that at the normal restaurant. It is a unique experience to have a daytime train trip and we hope you enjoy the scenery along the way. The train arrives in Yichang at 16:16 if it is on time. Your private guide will meet you at the exit of the railway station. You are suggested to have dinner before boarding the cruise ship. Your guide will recommend a good restaurant for you and then drive you to the Three Gorges Tourist Center and help you check-in your luggage. Then you will take a shuttle bus arranged by the cruise ship company to the pier to board your cruise ship. The cruise ship will set sail early in the morning. After having buffet breakfast at the dining hall, we suggest that you go up to the sunshine deck to view the first Gorge as you pass through. 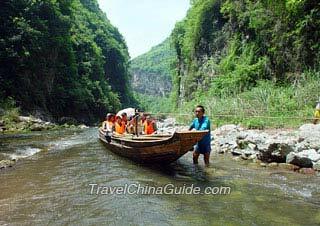 Xiling Gorge is the longest of the three gorges and has the most beautiful natural scenery along the river. Lunch is served on board and you will be assigned to a table in advance. In the afternoon, there will be a two-hour shore excursion in smaller groups to the Three Gorges Dam, the largest water-control project in the world. After you return to the ship there will be time if you want a short rest in your room. A welcome dinner will be held at around 18:00. After dinner, there will be a lively evening party. The programs are created and performed by the crew themselves. We hope you enjoy the party. 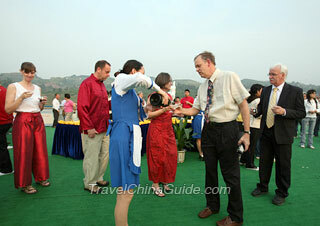 After having a buffet breakfast in the morning, you will have an exciting excursion to Shennong Stream. Different from the majestic and grand landscape of the main river, the scenery of branch Shennong Stream is elegant, graceful and peaceful as stream narrows and becomes clearer. First you will take a sightseeing boat for about 40 minutes, and then you will change to a pea boat that will take you even further upstream. The boat tracker will show you the primitive way of towing a boat, and the local guide is happy to sing a folk song for passengers. You will return to your ship in time for lunch. After lunch you will have the opportunity to view the gorgeous Wu Gorge and precipitous Qutang Gorge. The last onshore excursion is to Shibaozhai, which is famous for its fanciful architecture and many interesting legends. With the reputation of 'Pearl on the River', Shibaozhai has received 220,000 visitors from home and abroad every year since opened to the public in 1979. Now it has become the 'little Penglai' for visitors to overlook stunning riverviews. For the remainder day, you can just relax in your cabin, or enjoy the view on the deck, or attend some scheduled culture lectures. Tonight there will be a farewell party after dinner. The ship is scheduled to dock at around 09:00 in the morning. Follow the check-out procedure announced by the Cruise Company. Your Chongqing guide who will get on board and meet you at the lobby to take you on a brief city. First, you will visit the Panda House in Chongqing Zoo. The lively panda is a national treasure and is loved by people at home and abroad. Then you will visit the Ciqikou Village. This is a historical street with buildings mainly in Ming and Qing architectural style. The village is bustling with shops, where you can see many traditional crafts, such as refining sugar, making dough figures and Sichuan Facial Painting. You will find various traditional snacks and tea houses here too. Lunch is not included today. Ask your guide for recommendations of where to eat. This a good place to try Sichuan cuisine which is hot and spicy. Please let your guide know in advance if you do not like this kind of food. After lunch, we will take you to the airport for your flight to Xian. The local guide will meet you outside the baggage claim area at the airport. A private transfer will take you to the hotel we booked, and you are on your own for the rest of the day. 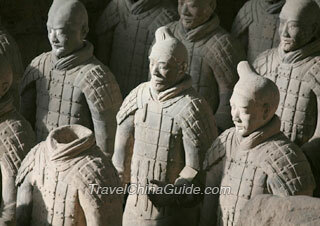 China is one of the world's four major ancient civilizations and Xian was once the imperial court for 13 dynasties. It is definitely an ancient historical city with rich cultural heritage. This morning, you will be picked up from your hotel and driven to visit the magnificent Terracotta Warriors and Horses Museum which is described as the Eighth Wonder of the world. The site is a buried pit for the first Emperor, Emperor Qinshihuang. Here you will find a large underground army, the Bronze chariots and Horses and many kinds of weapons. The miraculous construction not only astonishes people for its big squad, but also the superb craftsmanship of the ancient people. Lunch is on your own. You guide can recommend a local restaurant. After lunch, we drive you to the downtown area to visit the Provincial History Museum and then to the Small Wild Goose Pagoda & Xian Museum. Built in the Tang Dynasty (618-907), the pagoda is located in Jianfu Temple. With its quiet and beautiful grounds, the temple is a nice place to relax. 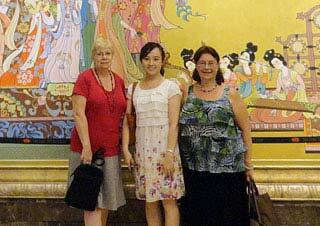 Your guided tour in Xi'an ends when we return you to your hotel. 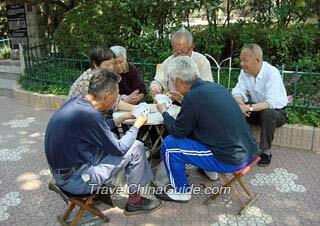 Your guide should give you your train ticket to Beijing before saying goodbye to you. Once you get the ticket, please double check the departure time. Today you are on your own. Here is a suggested itinerary. After having breakfast in your hotel, check out and store your luggage in the concierge. 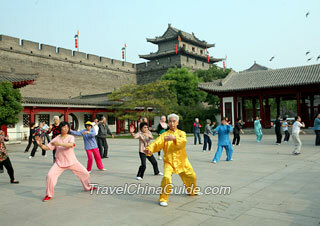 Walk south along the street for 20-25 minutes until you arrive at the South Gate of Xi'an City Wall. The 12 meter high wall was used to protect the imperial city. If you like to bicycle, you can rent one for CNY40 and ride on the wall. A deposit of CNY200 per bicycle is required. A short Warrior Parade Performance is held in the Barbican of the South Gate at 10:30 and 16:30. Do not miss it if your time allows. Leave the City Wall via the south street. Here there are many restaurants to choose from for lunch. In the afternoon, visit the Bell and Drum Tower. The Bell Tower is located in the city center just 5 minutes walking distances from your hotel. The ticket office for the Bell Tower is in the underground passage A joint ticket for the Bell and Drum Tower is CNY40 per person. The Drum Tower is in the north-west side of Bell Tower. Behind the Drum Tower is the Muslim street, where you can taste local snacks, buy some local souvenirs and prepare some fast food and water for your dinner. It is not easy to catch a taxi in Xi'an especially during the rush hour from 16:00 - 20:00. We suggest you take a bus to Xi'an Railway Station. You can catch the double-decked bus number 603 from the Bell Tower South Station. It takes about 45 minutes to Xi'an railway station by bus 603. The sleeper train has four berths in one compartment and the door can be closed at night. You can put your luggage on the baggage rack or under the lower berths. The train attendant will give you a card and take your ticket when the train starts running. They will give the ticket back to you before your arrival in Beijing. Boiled water is available on the train and you can also buy bottled water from the train seller. 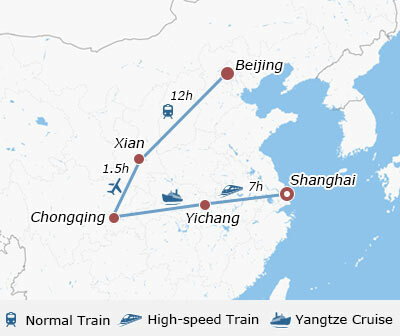 The overnight train takes about 11 hours to reach Beijing. The train arrives in Beijing at around 07:20 if on time. After getting off the train, you will find your private guide waiting for you at the platform. Sometimes the guides are not allowed to enter the station, so if you do not see your guide at the platform, please go out of the station following the stream of people and the guide will wait for you at the exit with your name on a sign. Breakfast is on your own. If you like, you may ask your guide to take you to a local restaurant and try some Chinese style breakfast. 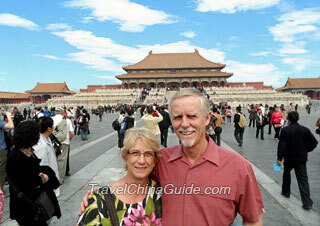 Your guide will take you to visit the Tiananmen Square and Forbidden City this morning. 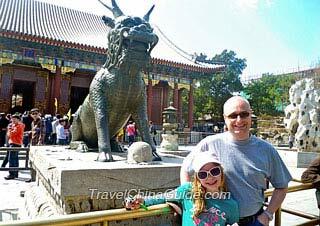 The Forbidden City was the imperial palace for Ming and Qing Dynasty. Covering an area of 720 thousand square meters, it takes at least 2.5 hours to visit the main spots. Please arrange your own lunch. Your guide will recommend a nice restaurant at your request. Then you will be escorted to explore the Summer Palace. We will take you back to the hotel and hope you have a good night. The Great Wall is one of the greatest world heritage sites and you should not miss it. Today, your guide will take you to visit Mutianyu, one of the most famous and spectacular sections of the Great Wall. It is more than 65 kilometers so you need to start the day early. To save your time, we will arrange round trip cable car for you. Please bring your own lunch. Or you can ask your tour guide to recommend a proper restaurant near the site for lunch. On the way back we will stop near the Bird's Nest to allow you to take photos from afar. We will end our day with a visit to the Temple of Heaven. Your tour guide will say “bon voyage” to you at the hotel and wish you a safe journey home. Your impressive China exploration ends today. Check out of the hotel before noon to go to the airport. Beijing Capital Airport has three Terminals and the T3 is the second biggest airport terminal in the world. In order to avoid any problem, please make sure which terminal your flight will take off from. A taxi ride from your hotel to the airport will take around 30 minutes and cost about CNY90 per cab. However traffic jams have became more and more serious in Beijing, please take this into consideration when you plan your pick up time. then flying to Frankfurt 144 applicable? If the departure country is the third one, you can enjoy the 144 hours visa free policy. Any taxi counters at Chongqing Jiangbei airport arrival hall? Will be arriving at Chongqing around midnight with my daughter. Have checked with hotel and they do provide airport shuttle at CNY300 per trip which I find is abit on the high side. Appreciate some advise from fellow travellers who have been to Chongqing as to where can I get a taxi in the middle of the night. Don’t worry, there are many taxies available at night. By the way, Shuttle bus line 1 to downtown area is available until the last flight. You may take it! Which deck should I stay? Hi, I am prone to seasickness. Which deck of Yangtze cruise is more comfortable for me? I have been on the Yangtze River Cruise and it is very stable, passengers will not feel they are on the river during the journey. However, if you have the heavy seasickness, I would like to suggest you stay at 3rd floor of the ship.